I feel like a Skinnytaste evangelist. Whenever cooking comes up in conversation, I always tell people that they need to check out Skinnytaste. This website, and now its book version, has made my life infinitely better. People who meet me today could probably never guess that I used to be overweight. I was never morbidly obese, but I was solidly in the overweight range. Exercise was never my problem. I have always played sports, gone to the gym, gone for bike rides, even run in 10k road races. Eating unhealthy food (and large portions) was what made me gain weight. One summer back in 2009, I moved into a new apartment and spent a lot of time painting it after work, so I didn't have time to cook. I'd find myself getting takeout food every night, and the weight started to creep on. On top of that, I played on a softball team that was sponsored by a bar, so we'd go there after games and get drinks plus pizza or nachos. In just a couple of months, I had put on nearly 15 pounds and was feeling very discouraged. Luckily, my job at the time had Weight Watchers at Work, which I joined and lost my summer softball/moving-into-a-new-apartment weight and then some. After four months or so, I had lost over 30 pounds and was no longer overweight for the first time in my life! Weight Watchers taught me many things, but the most important lesson was that it's important to cook for yourself (or have someone else cook you healthy meals, if you are that lucky). Restaurant meals are inevitably laden with fat and salt, and you never know exactly what the ingredients are. So I knew I needed to cook for myself, but the problem was that I didn't know how! I had a couple of things I could make (mainly grilled chicken on the George Foreman Grill or stirfry with vegetables and brown rice), but eating the same thing every day got a bit boring. When my boyfriend moved in with me, I knew I needed to step up my cooking game because he cooked even less than I did! The problem that many people who are watching their weight face is how to cook meals that are healthy but don't taste healthy. Even more difficult is cooking for family members who only care about how things taste, not their nutritional value. Enter Skinnytaste. Before I got this glossy, 300-page cookbook, I often used the Skinnytaste website to find recipes. Blogger Gina Homolka ingeniously creates recipes that are both delicious and healthy, a rare combination. In addition, her instructions are extremely easy to follow, so she has increased my cooking confidence immensely. Before Skinnytaste, I used to tell people, "Oh, I don't really know how to cook." But now I feel confident enough to cook dishes for dinner parties, etc., using Gina's magical recipes. I've used recipes from a couple of other sources, including Cooking Light, but Skinnytaste recipes are a lot easier to follow and don't require as many steps. A couple of months ago, my boyfriend and I hosted a Super Bowl party, and I used Skinnytaste for all the recipes. People nearly licked the bowl of the buffalo chicken dip, and no one could believe it was from Skinnytaste. Gina's turkey chili was also a big hit. 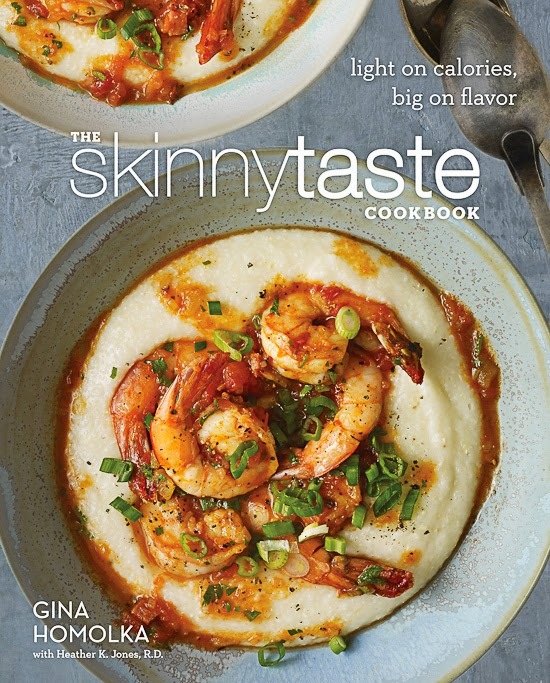 I still use the Skinnytaste website more than the book because it has many more recipes, and it is searchable. However, this beautiful glossy book is helpful to use for inspiration and would make a great gift. Flipping through a book is more satisfying than scrolling through a website, and the book is well laid out and has separate chapters for breakfasts, soups and stews, sandwiches, appetizers, salads, chicken, meat, fish, vegetarian main dishes, vegetarian side dishes, and desserts. One of the best parts about the Skinnytaste cookbook is that all the recipes include detailed nutritional information: calories, fat, saturated fat, cholesterol, carbs, fiber, protein, sugar, and sodium. The website also includes Weight Watchers PointsPlus values. The book doesn't include this information, but I use My Fitness Pal now, and pretty much all of Gina's recipes are in the MFP database, so it's extremely easy to track. This book is very helpful for people with families. Most of the recipes contain 6-8 servings and main dishes are usually between 300 and 400 calories per serving. The serving sizes are generous and you won't feel deprived, but depending on the day and how much exercise I've done, I sometimes eat two servings of a recipe for dinner (and my boyfriend almost always does), so each recipe will last us 2-3 days. Luckily, he's fine with eating the same thing a couple of days in a row, so I only end up cooking 3-4 days a week. Yay, leftovers! The recipes are also very easy to double if you have a larger family or are having a party. The best part is that no one will ever know this recipes are "light"! They simply taste delicious. Some favorites I have made from the book include chicken enchilada soup, chicken pot pie soup, baked zucchini sticks, buffalo chicken salad, turkey bolognese, chicken enchiladas, chicken parmesan (one of the most-frequent requests at our house), cheesy baked penne with eggplant (with or without ground turkey), and broccoli mac and cheese. The recipes are also very easy to modify if you don't have a particular ingredient or, like me, want your recipes a bit spicier. A couple of the recipes are a bit bland as written, so I'll add red pepper flakes and/or cayenne pepper. Also, some of the turkey dishes call for 93% lean, while others tell you to use 99%. I have discovered that 99% is too dry for me and the 93% is worth the extra calories. Plus, it tends to be cheaper at the supermarket. As you make more recipes, you'll become more confident about making your own changes to them based on your personal taste. Official disclaimer: I received this book for free from Blogging for Books for this review. 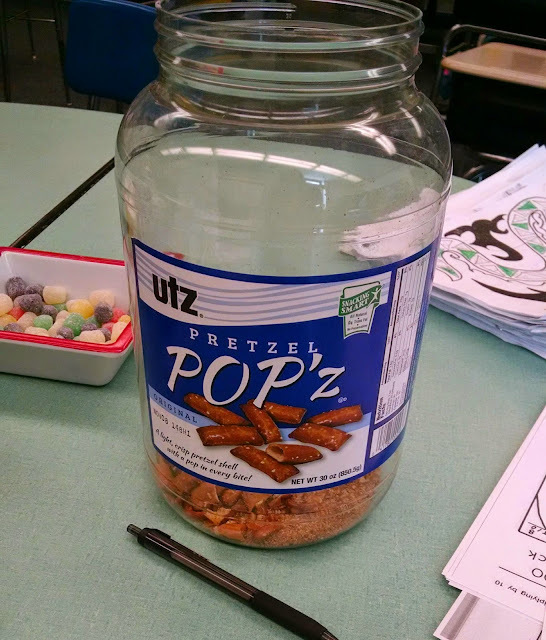 When I saw this tub of pretzels was in the teachers room at my school, I thought I was imagining things. Adding an apostrophe prior to an "s" to make a word plural is bad enough, but a "z"? Why, Utz, why?